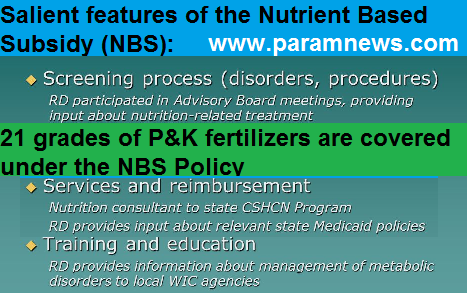 Under the Nutrient Based Subsidy (NBS) scheme, a fixed amount of subsidy decided on annual basis, is provided on each grade of subsidized Phosphatic & Potassic (P&K) fertilizers depending on its Nutrient Content. At present 21 grades of P&K fertilizers are covered under the NBS Policy. The other salient features of the NBS Scheme are annexed. The Government of India has notified the New Urea Policy (NUP) - 2015 on 25th May, 2015 for existing 25 gas based urea units with the objectives of maximizing indigenous urea production; promoting energy efficiency in urea production; and rationalizing subsidy burden on the government. Further, an amendment to New Urea Policy-2015 has been issued on 7th April, 2017. Para ‘5’ of NUP-2015 in respect of the production beyond Re-assessed Capacity (RAC) for year 2016-17 has been amended. By said amendment, ceiling imposed on production beyond RAC during the year 2016-17, has been raised so as to enable all urea units to produce additional production which otherwise were not able to do so due to low Import Parity Price to address any future fluctuation in Import Parity Price that would have adverse impact on the production beyond RAC by urea units, Para 8 has been included in amendment to NUP – 2015 which authorizes DoF to take appropriate decision in consultation with Department of Expenditure. However, at present, there is no proposal under consideration of the Government to review the NBS policy. The Maximum Retail Price (MRP) of urea is statutorily controlled by the Government and it is Rs. 5360 per MT (exclusive of tax) w.e.f. 01st November, 2012. Further, an extra MRP of 5% (of Rs. 5360/- per MT) is charged by the fertilizer manufacturing entities on Neem Coated Urea. It has been made mandatory for the fertilizer companies to submit along with their subsidy claims, the cost data of their fertilizer products from 2012-13 onwards in prescribed format on six monthly basis to find out reasonableness of MRP fixed by them. The Department has also appointed Cost Accountants/ Firms to scrutinise the said cost data to ensure that the prices fixed by the fertilizer companies are reasonable. It has also been stipulated in the provisions that in cases, where after scrutiny, unreasonableness of MRP is established or where there is no correlation between the cost of production or acquisition and the MRP printed on the bags, the subsidy would be restricted or denied even if the product is otherwise eligible for subsidy under NBS Scheme. In proven case of abuse of subsidy mechanism, the Department of Fertilizers, on the recommendation of Inter-Ministerial Committee may exclude any grade/grades of fertilizers of a particular company or the fertilizer company itself from the NBS Scheme. Before the commencement of each cropping season, Department of Agriculture, Cooperation and Farmers Welfare (DAC&FW), in consultation with all the State Governments, assesses the requirement of fertilizers. After assessment of requirement, DAC&FW projects month-wise requirement of fertilizers. The State Governments are regularly advised to coordinate with manufacturers and importers of fertilizers for streamlining the supplies through timely placement of indents for railway rakes through their state institutional agencies like Markfed etc. Further, Government has declared fertilizer as an essential commodity under the Essential Commodities Act, 1955(ECA) and notified Fertilizer (Control) Order (FCO), 1985 & Fertilizer (Movement Control) Order, 1973 under the EC Act. State Governments have been adequately empowered to ensure selling of fertilizers at MRP besides stopping black marketing/smuggling of fertilizers.